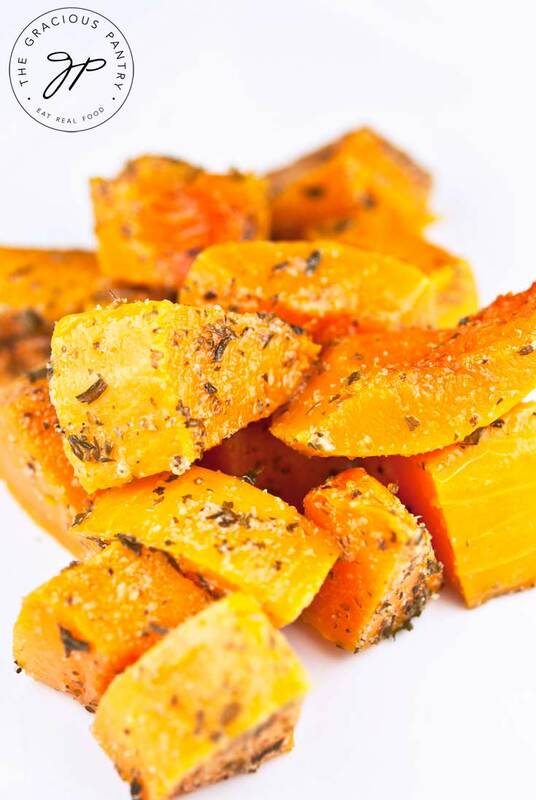 This clean eating herb baked butternut squash makes a great side dish for almost any main course! This is a very simple recipe that I learned to make when I lived in Germany. The family I was a nanny for was HUGE on clean eating, even though they didn’t know to call it that. In their house, much of the food was grown in their yard or purchased at an organic and biodynamic store. Going out to eat was a once-a-year event, and nothing (and I do mean nothing) processed ever entered the house. This wasn’t about dieting, it was simply about health and well being. They wanted to raise healthy kids, so they ate healthy. Simple as that. So several of my recipes on this site are recipes I learned to cook while I lived with them for almost a year. It was a fabulous time in my life. Thankfully, I was smart enough to write down all those recipes. And that’s saying something for my teenage years! They typically served this with a whole grain and maybe a sausage or some other piece of meat. But honestly, I could eat this all by itself with not problem. It makes a great side dish to just about any fall or winter meal and is very filling as well. The mix of herbs really brings out the flavor of the squash. This would even be great with some salmon or steak! 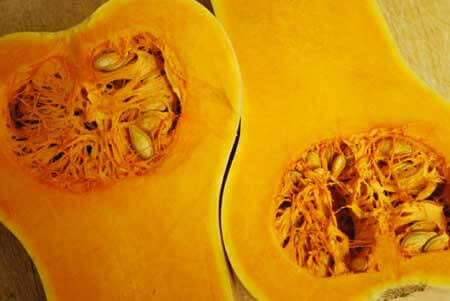 Any way you serve it, it’s sure to make butternut squash lovers out of anyone. A delicious side dish or even mid-day, healthy snack! 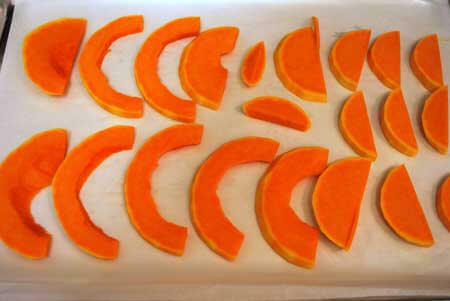 Clean out the seeds, peel and slice to about 1/4 inch thickness. You can leave them like this, or chop them as I did in the photo at the top of this post. Lay out the individual pieces on a baking sheet lined with parchment paper. Using an oil sprayer, spray the squash with a very light coat of olive oil. Then liberally sprinkle the herbs and spices over the squash. Bake at 350 degrees F. until soft (about 30 minutes). Note: If you are really watching your fat intake, skip the olive oil and sprinkle lightly with lemon juice instead. Please note that the nutrition data for this recipe is not available. I’m sort of embarassed to admit it, but I have avoided fresh butternut squash because it seemed too complicated. This looks great — thanks for breaking it down! Molly – You’re welcome! 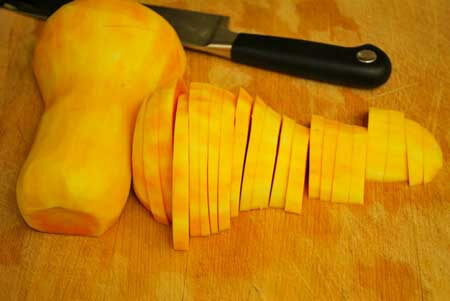 Butternut squash is easy! You’ll see! Charlena – Thank you! What a wonderfully informative comment! I’m sure many will use your suggestion (including me!). Happy new year! I made this for my family tonight and everyone (even my dad who sometimes balks at my new recipe endeavors) raved about it. This recipe is going in my recipe scrapbook immediately. Thanks Tiffany! Tammie – Fantastic! I’m glad everyone enjoyed it! Oh my goodness! Butternut squash is one of my go-to veggies, and I’ve made it many, many different ways. I think this is the best yet! 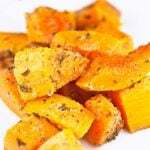 I love how the natural sweetness of the squash plays with the savory spices. Thank you so much!